This is such a cute set. It is cotton so it breathes. The two accessory pillows that come with the are adorable, especially the shark! Looks great in my son's room with a beach theme. Great quality. 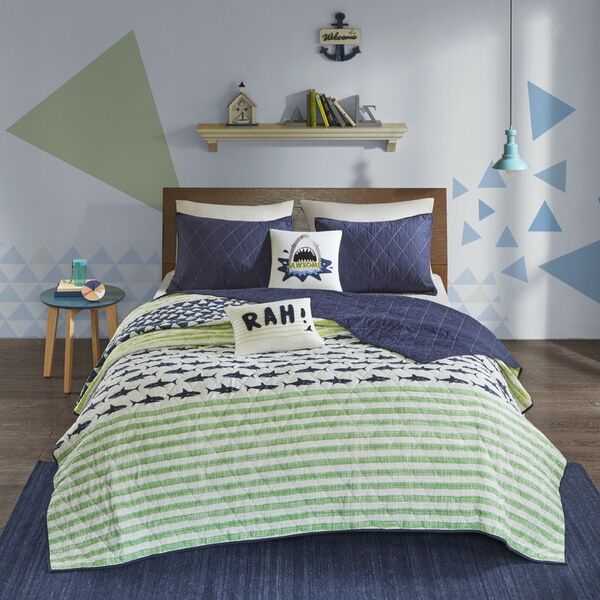 Make a splash with this graphic coverlet set from Urban Habitat. The quilted cotton coverlet features bold green stripes, blue sharks, and a solid navy backing that coordinates with the included shams. This machine washable set includes two embroidered pillows to give your set a unique, custom look. This quilt set is very cute. We bought two sets for twin beds in my 6 year olds room. The fabric is not too heavy, but washes well and comes out of the dryer looking just fine with a little smoothing. The navy sham is also thin, but perfectly fine. The two decorative pillows are cute but not well made. One had a pop in the stitching at the bottom and would have been hard to mend. Just got rid of that since two of everything is a bit too "themey". We have some other beach and shark whale pictures in white frames with a nuetral grey area rug and a cobalt blue dresser we spray painted for a pop of color. Looks really nice without being too "babyish" or scary. I would recommend! These sets are very cute for the kids. These are quilts and therefore thinner. The prints are cute and for a simpler look they can be reversed to a navy side which has a diamond pattern created by white stitching. My only comment would be that the decorative pillows are white with stitched designs. Being that they are for kids and sometimes played with and handled more often, the accent pillows might be better if in a different color, not so easily stained by little hands. The colors look as pictured. It is not a super soft material. I have not yet washed the sets. Love this set! Good quality and looks so great with a twin set I up cycled. My 4 year old LOVES this bed set. I love it too. We ordered this a year ago and it's still going strong! It's comfortable, cute, and will last us a long time. Love the set and colors. The fabric quality is great and it matches perfectly with my kids bedroom decor. I totally recommend it if you're looking for something fun but yet elegant. Adorable coverlet set. My sons like them because they are light weight for summer & you can put blankets underneath for warmth in winter months. I purchased two of these for my sons bunk beds. They both love sharks so they really like them. They come with decorative pillows that really add to the set. Seems to be good quality. I have yet to wash them so that will be the test to see how they hold up. For now, theyre winners for everyone. 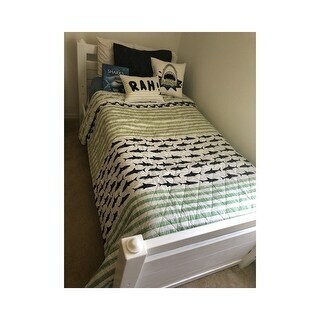 Fun bedding set for a ocean or fish decorated room. The price was good and it arrived within the week. I would buy bedding from this company again. Adorable, great for spring, summer use. Colorful as well. Bought as a gift for my great grandson. It is super cute and looks great on his bed. Quality was better than I expected for the price. Colors are vibrant good quality really happy with my purchase. Great quality and design. Finished off my sons room perfectly! Great quality quilt! Highly recommend. Love this bedding set! The colors are so cute together. It is great quality also! My 6 year old son absolutely loves it! Looks super cute in my 6 year old sons room! Very cute and at a reasonable price. Porque es donde más económico estaba. "I’m interested in ordering a bedding set but wondering what a coverlet is?" A coverlet is a lightweight, non-reversible bedspread that is usually either quilted or woven. It is generally designed to be a decorative layer to go over thicker bedspreads. Coverlets often have a thin layer of batting, making them appropriate for use as a stand-alone bed covering.